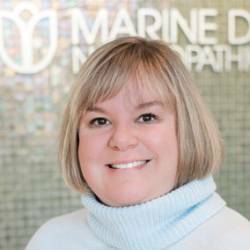 Dr. Cathryn Coe is extremely pleased to be the Owner and Clinic Director of Marine Drive Naturopathic Clinic. Born and raised on the North Shore, it was always her dream to open a modern, spa-like clinic in which to practice her passion – helping patients to understand the root cause of their illness and offer options to help them look and feel their best. Dr. Coe first became interested in Naturopathic Medicine as a teenager when she was under the care of an established ND for allergies and food intolerances. Her health improved dramatically and she became interested in a model of medicine that used a wide variety of natural therapies, along with diet, in order to improve lifespan wellness. She graduated from UBC and later went on to study at the Boucher Institute of Naturopathic Medicine, graduating in 2005. She spent several years serving as a shift supervisor at the school’s teaching clinic, as well as taught several business classes. Currently she serves as both the Chair of the Patient Relations Committee, as well as participates as an active member of the Scope of Practice Committee for the College of Naturopathic Physicians of BC. Dr. Coe’s hope is to help patients to understand the possible cause of their health concerns and determine safe and effective treatment options. In her spare time she enjoys cooking, travel, and exploring the North Shore with her husband and young son.